Eastern sophomore Steven Fitzgerald takes down a Wahama opponent, during the ‘Battle of the Birds’ on Dec. 19 in Tuppers Plains, Ohio. VINCENT, Ohio — Sometimes it doesn’t even take one to win. 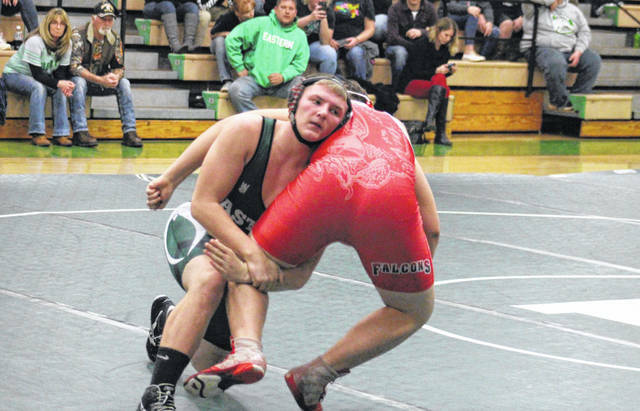 The Eastern wrestling team came away with second place on a tiebreaker Thursday during a tri-meet held at Warren High School between the Eagles, host Warriors and Fort Frye. Eastern claimed only two victories against Warren, the eventual champion of the three-team event. EHS and Fort Frye, however, need extra criteria to determine a winner after finishing tied at 24-all. The Eagles ended up winning the dual match with Cadets on near-falls, allowing the Green and White to bring home runner-up honors. Blake Newland (126), Daniel Harris (160) and Steven Fitzgerald (195) each scored pinfall wins in their respective matches against FFHS, while Nick Little also picked up six points on a forfeit at 220 pounds. Three of Fort Frye’s four wins were also by forfeit. Fitzgerald won by forfeit against Warren, while Ryan Ross scored a pinfall win at 120 pounds against the Warriors.